Designed by Albert Frey and Robson Chambers. 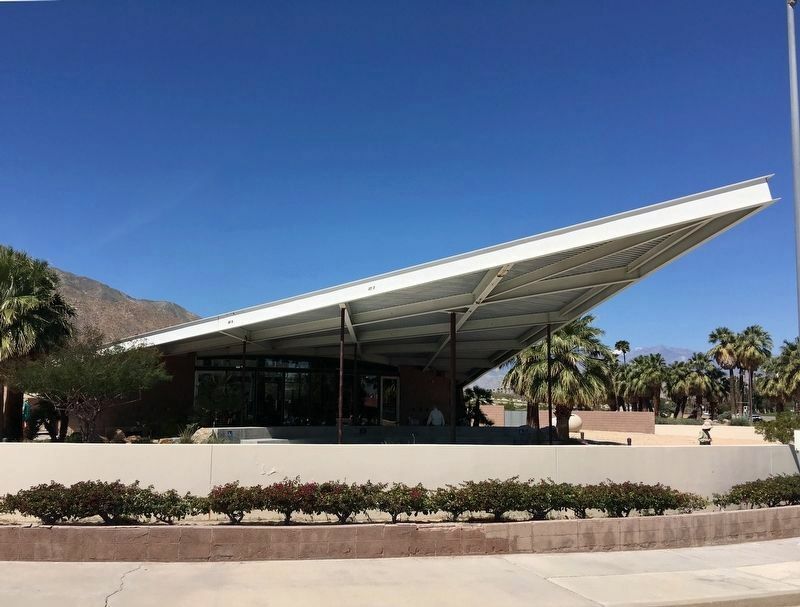 Conceived by developer Culver Nichols as an entry statement to Palm Springs, the roof is a hyperbolic paraboloid of steel I-beams and corrugated metal roofing supported by steel tubular pillars. Albert Frey was consulted in its 1998-1999 adaptive reuse as a sculpture gallery. Location. 33° 51.498′ N, 116° 33.491′ W. Marker is near Palm Springs, California, in Riverside County. 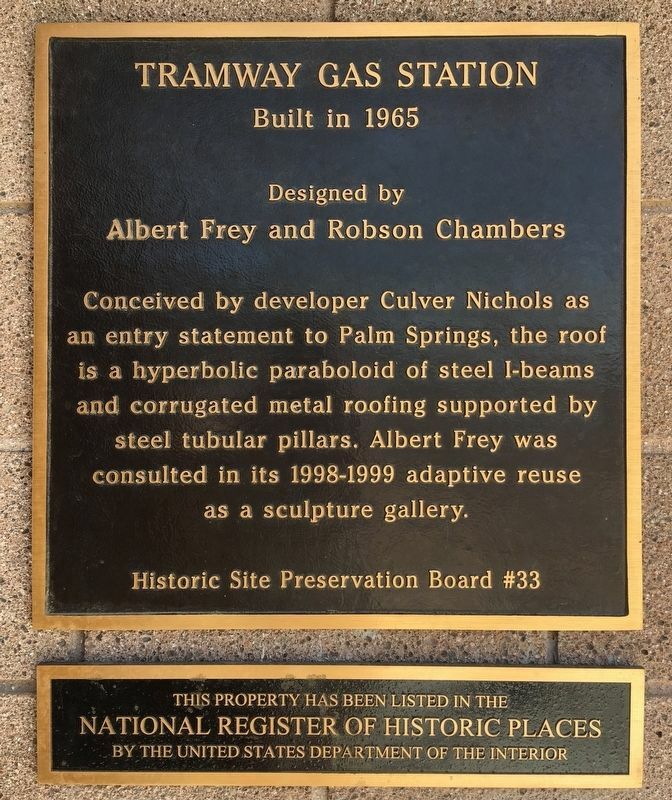 Marker is at the intersection of Tramway Road and Palm Canyon Drive, on the right when traveling west on Tramway Road. Touch for map. 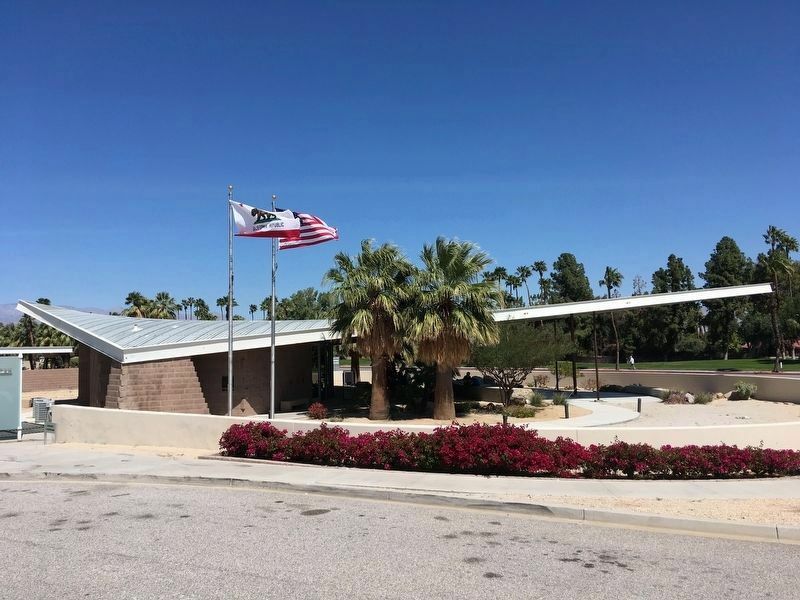 Marker is at or near this postal address: 2901 N Palm Canyon Dr, Palm Springs CA 92262, United States of America. Touch for directions. (approx. 2.1 miles away); General Telephone Building (approx. 2.2 miles away); The Cork'n Bottle Building (approx. 2.2 miles away); Site of First Community Church (approx. 2.4 miles away); Lykken’s Department Store (approx. 2.4 miles away); Desert Inn (was approx. 2½ miles away but has been reported missing. ). Touch for a list and map of all markers in Palm Springs. Regarding Tramway Gas Station. 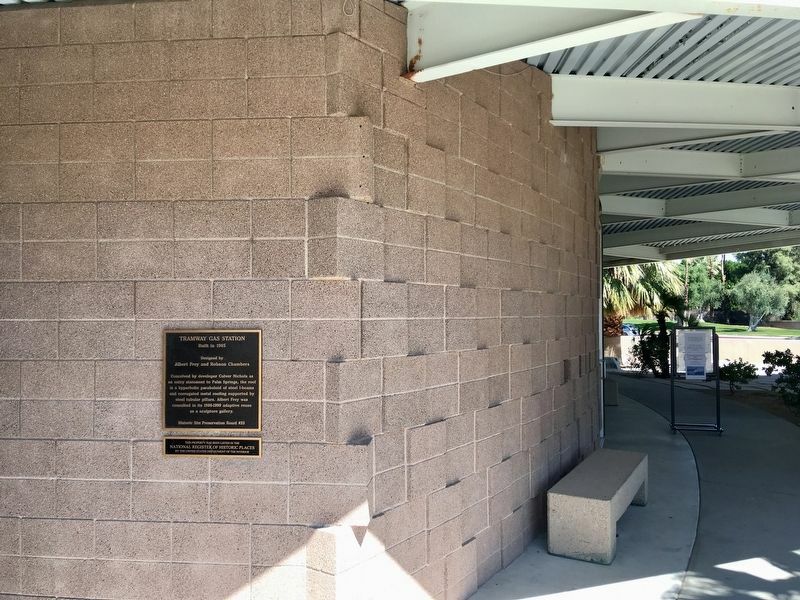 This building is now the Palm Springs Visitors Center, open daily 9-5. The roof is a hyperbolic paraboloid. 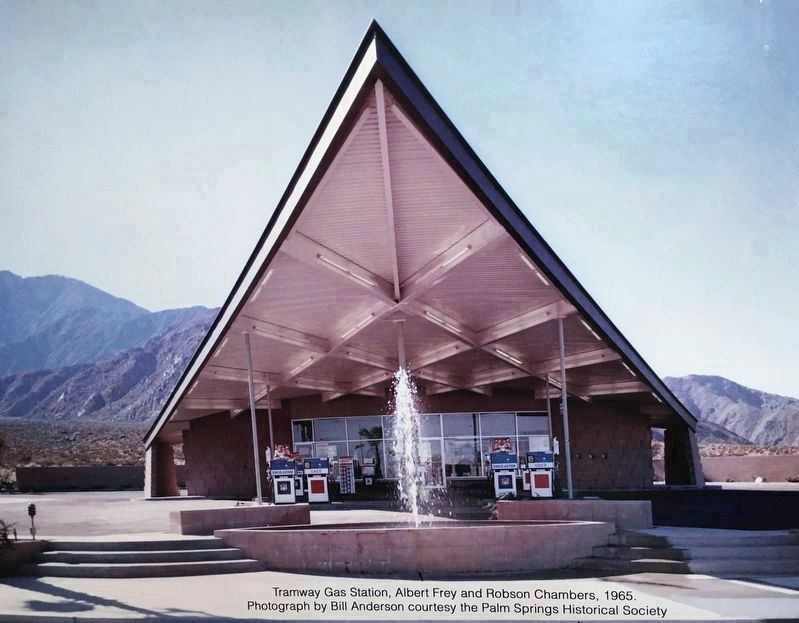 Tramway Gas Station, Albert Frey and Robson Chambers, 1965. More. Search the internet for Tramway Gas Station. Credits. This page was last revised on March 30, 2019. This page originally submitted on March 29, 2019, by Craig Baker of Sylmar, California. This page has been viewed 67 times since then. Photos: 1, 2, 3, 4, 5. submitted on March 29, 2019, by Craig Baker of Sylmar, California. • Andrew Ruppenstein was the editor who published this page.